How do I paint Heresy Space Wolves? Here is the progress I am making on the paint scheme. 1) First I prime with Vallejo Game Air German Panzer Grey. 2) Then I put down a base coat of Vallejo Game Air Cold Grey. 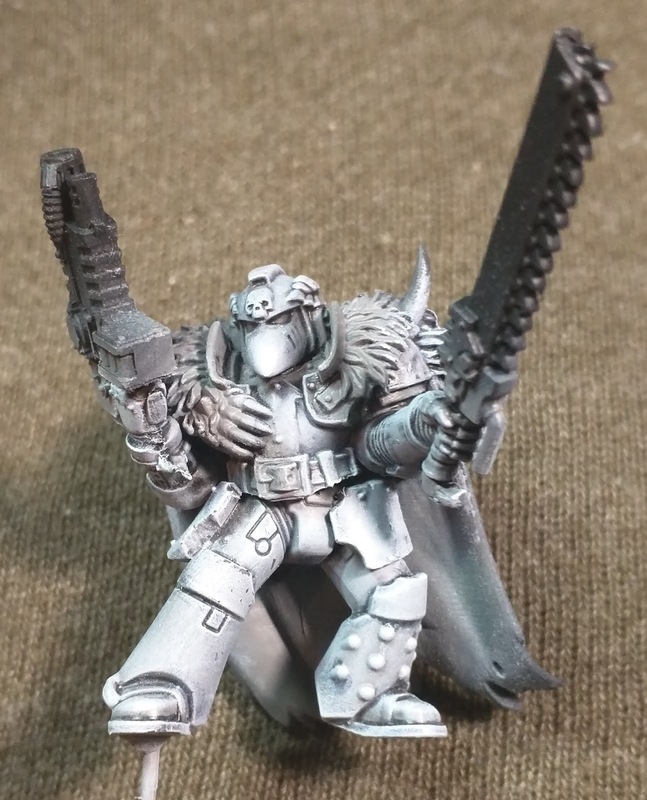 This gave a solid grey base to work with. 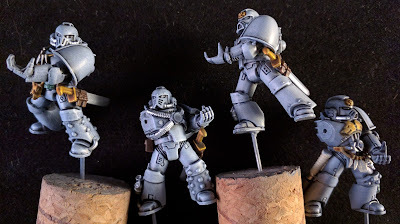 Highlighting this was going to be a little problematic, so I did a high PSI long distance light mist of Vallejo Game Air Sombre Grey as a zenithal highlight very subtlety, just to give the color a bit more depth. 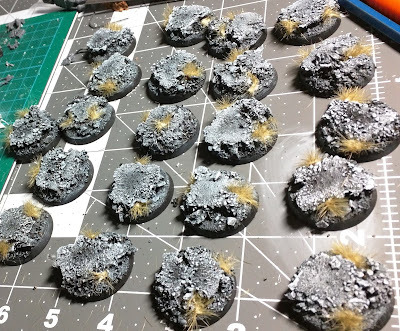 3) Black-lining wash to shade the recesses. 4) I then highlighted the flat panels back to a solid grey, using Vallejo Game Air Wolf Grey. 5) In this step, I started blocking in the details (chest plates, blade hilts and skulls) starting with the golden details. I used my usual recipe for the gold. Starting with Vallejo Game Color Brass, with a shade of Vallejo Game Color Wash Sepia which adds depth and definition. 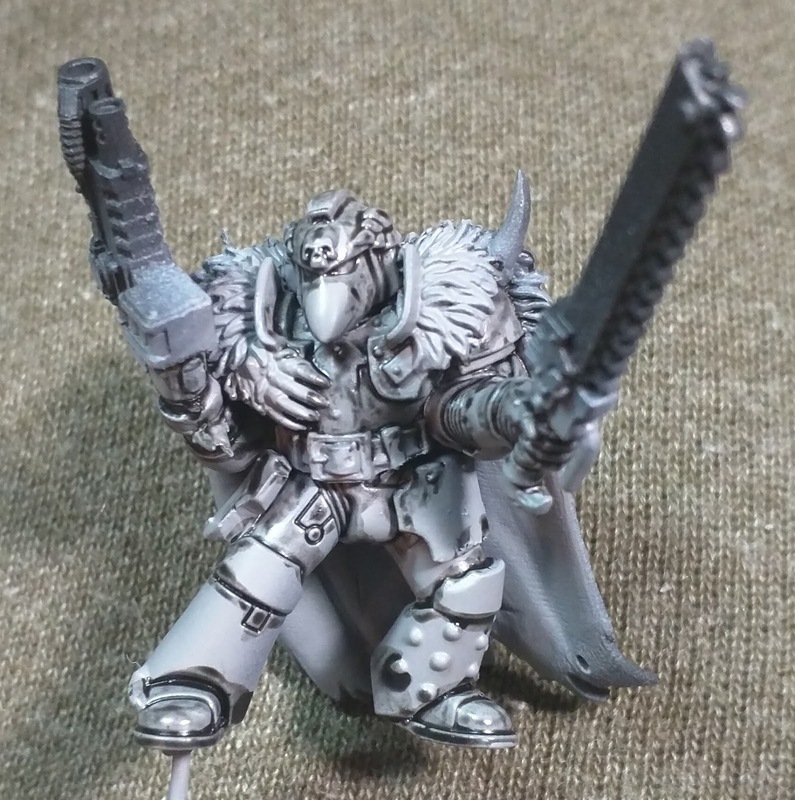 6) Next step was to block in the furs, with Vallejo Game Air Bonewhite. 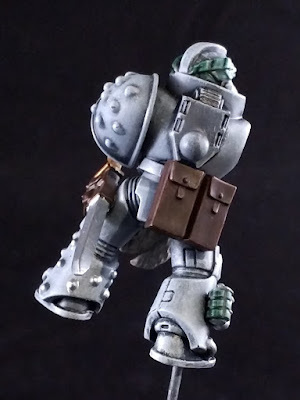 7) Vallejo Game Air Steel was applied to the combat blade, Mk4 Harness, Helmet hoses and various ceramite armor studs. 8) Vallejo Game Color Heavy Green was painted onto the grenades and laurel. 9) Vallejo Game Air Charred Brown was used on the packs and the scabbard on the combat blade. Next step will be to shade the furs, steel details, packs and holsters. 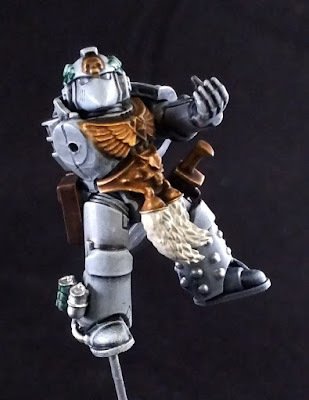 Note I have done this minus the bolter arms, so I can get to the chest details. FWIW, their bases are already done. 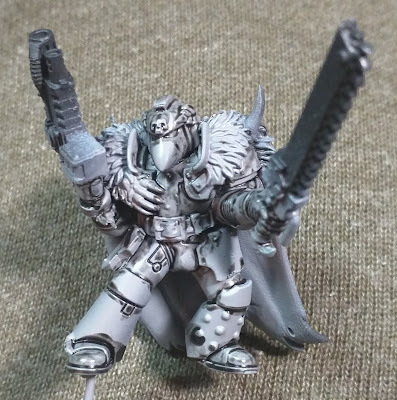 Same recipe as what I did on the StormWolf base.